French Caricature: Medical Caricatures or Political Commentary? French Caricature: Hunchbacks–Mocked or Mocker? Ah!… aye!… le cas est pressant. Béraud, Genty, Editeur; Rue St. Jacques, No 33. In this print the artist successfully makes fun of both an obsession concerning bodily functions, particularly those associated with the gastrointestinal tract, and the upper class. 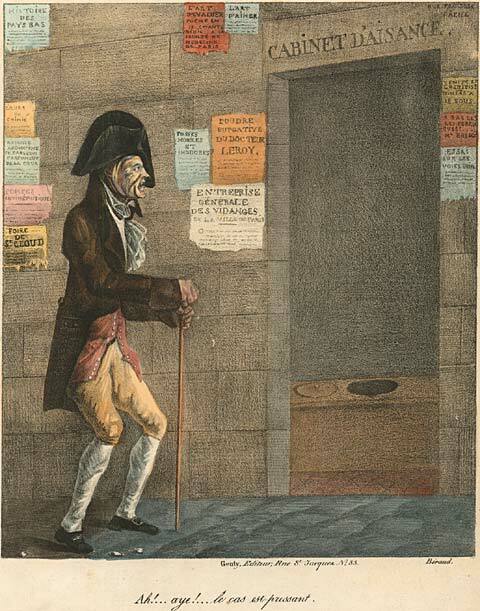 As a man approaches the “Cabinet D’aisance” or the privy, the caption notes that his need is urgent. Signs, some legible and others not, are posted all around the entryway. There are advertisements for a purgative powder by Doctor Leroy, moveable odorless pits or toilets, and pumps for bad smells. Another poster dedicates a poem in twelve verses, “The Art of Evacuating,” to the Faculty of Medicine of Paris. The sign regarding the history of the low countries, refers to Belgium and Flanders, but also is a pun on the lower abdominal regions of the body. There are notices for the art of loving, septic drainage, a course of chemistry, and an essay on the urinary tract. The sign offering dinner for the cheap price of 18 sous might imply that the customer will also desperately need the outhouse after dining. The “Foire de St. Cloud” notice mocks the royalty who maintained a residence at Saint-Cloud. Foire can be translated as a fair or market, but more significantly given the sign’s position outside a privy, another meaning for foire is diarrhea. An additional gibe at the upper class is the poster that declares, “down with the wigs,” since hairpieces were worn by the wealthy and powerful.